I really wanted to make sufganiyot tonight. Sufganiyot are Israeli confections – donuts that are deep-fried, filled with custard or (more commonly) jelly, and dusted with sugar. Unfortunately, my mom was set on making latkes and used up all the vegetable oil, so the sufganiyot will have to wait. 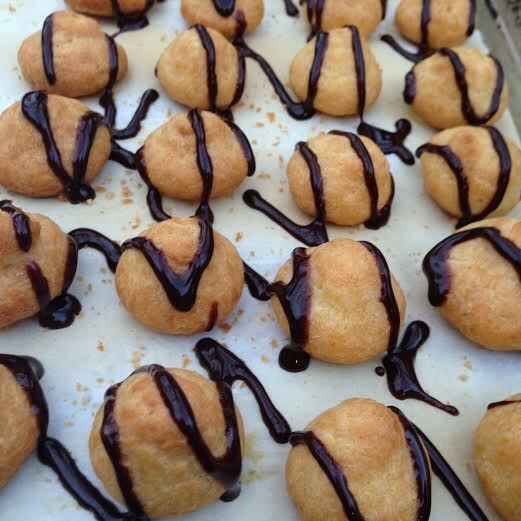 Cream puffs (profiteroles and cream puffs are the same thing, for the record..I just wanted to play up the alliteration) are aesthetically similar to sufganiyot, but their cooking processes differ. Cream puffs start with a roux (fancy French term for cooking flour and fat together on the stove), then the batter (dough?) is piped onto a baking sheet and put into a hot hot hot oven for a few minutes. 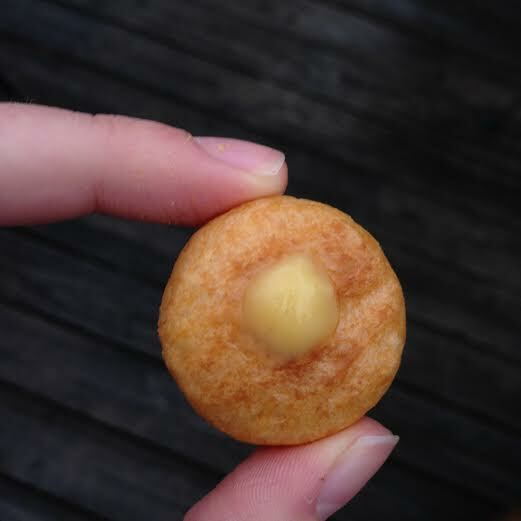 The puffs, well, puff up, resulting in a crunchy outside and a hollow inside. Sufganiyot, on the other hand, are made from a yeast-based dough. They have to proof twice, then they’re fried in a few pints of oil. These were soooo easy. I cheated and used vanilla pudding mix and pumpkin butter for the filling, but the pastry was surprisingly forgiving and only took about twenty minutes total. Go crazy with the filling/toppings! I want to try peanut butter and jelly stuffed puffs, or maybe a whipped cream/pistachio/cranberry sorta thing. Or savory ones with a dill cream cheese and smoked salmon filling and capers and red onion minced and sprinkled on top!!!!! 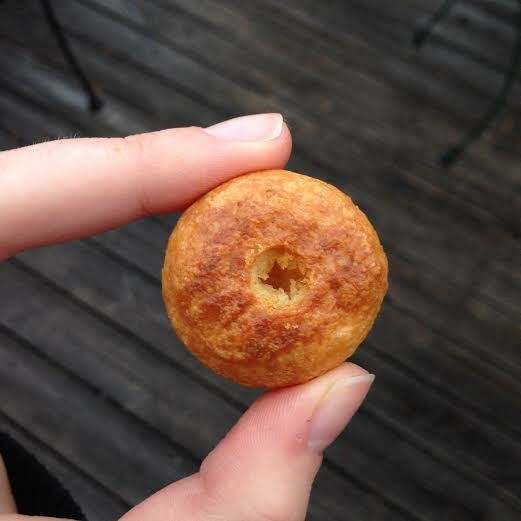 WOW like a mini, airy, stuffed bagel. Chocolate sauce, caramel, sprinkles, etc. Preheat oven to 425ºF. Bring the water, butter, and salt to a boil in a medium saucepan. Reduce the heat and add the flour all at once, beating vigorously with a wooden spoon until the mixture has formed a sweaty ball and pulled away from the sides of the pan. Let cool for a few minutes (you don’t want the eggs to cook when you add them). Add the eggs, beating with the spoon until well-incorporated. The batter should be very thick and homogeneous. Transfer the batter to a piping bag fitted with a large straight tip. Pipe 2-inch circles of the batter onto a parchment-lined baking sheet, leaving at least 2 inches of space between them (they’ll grow). Press down the tops of the circles if they’re sticking up. 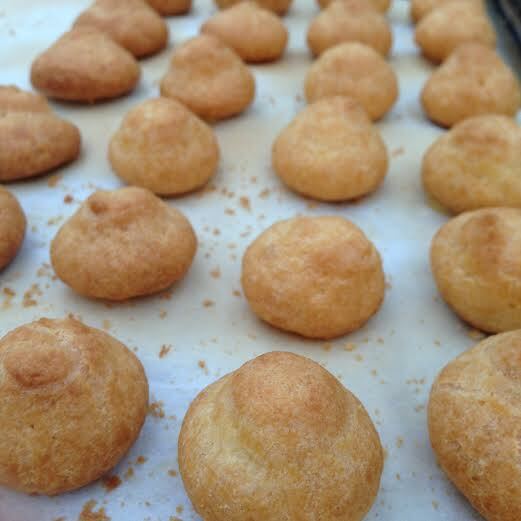 Bake for about ten minutes, or until the puffs are golden brown and ……… puffy. Let cool for a few minutes. Whisk together the filling ingredients for two minutes, or until thickened. To assemble, put the filling into a piping bag fitted with a small tip (I used a closed star). Use a sharp paring knife to poke a hole in the bottom of each puff, and pipe in the filling. Drizzle with chocolate or other topping. Freeze for at least fifteen minutes on the baking sheet if you want them chilled (I recommend this), or eat immediately. These can be kept frozen in a container for up to a month.